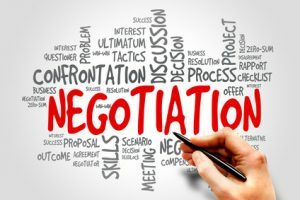 Every entrepreneur and business manager has to learn the skill of negotiating at an early stage. Not everyone is an expert from the start and it takes time and a few hard lessons to get there. This is key before starting any negotiation. For e.g. do you know exactly what you want from your customer pricing deals? Is it a 3% price increase or 4% price increase and if so why? You have to do your homework and know what impact every 1% price increase has on your bottom line and the consequences of not getting it. Negotiating with your largest customer and not getting an additional 1% price increase may be damaging to your profitability. Once you know what you want, don’t be afraid to ask for it even if it may sound totally crazy to the other party. It maybe that you are making a loss on your largest customer and cannot afford to do that any longer. For e.g. you may need to ask for a 10% price increase. You can also be assertive once you know what you want and challenge everything. Remember to aim high and refuse to take NO for an answer. You must do your homework and not only know your own numbers but the other side’s numbers as well. Do you know how much profit they made in the last financial year? What are their pressures? Have their profits fallen recently? Have they been in the industry press recently for doing well or doing something badly? What are they doing with other suppliers? Knowing what’s going on in your industry is vital. You should know the impact on their position if they give you what you ask for, so you can understand their position. The more information you have on the other side, the stronger your position. Don’t leave money on the table by failing to do your homework. Once you have done your homework and understand their position, you will be able to show them how their needs can be met. The situation has to be win-win for both parties. The other side will have demands and also their bottom line, so there will be room to negotiate. Remember, what the other side puts out as their demands do not have to be met but only their bottom line. Sharing your information can also be helpful. If they don’t want to share their information, this will be solely due to a lack of homework on their part, which gives you a stronger position to stick to what you want. I have been in negotiations where sharing information has opened doors to much better outcomes than first thought. Usually, it has been because the other side has not been able to do their homework on their own numbers, which made their position weaker. When you don’t have the reasons for why you are asking for something, it makes you weaker. When you focus on their pressures and not on your own, your position will be stronger. Silence is a powerful tool in negotiations and not used often enough. When an offer is made, even if it meets your needs, don’t say anything but take time to reflect. Silence gives nothing away to the other side and keeps them uncertain. It also gives you a time out to think about your next step and may help in improving your position further. Listening more than talking is the best form of negotiating and the more you keep silent and listen, the more you will learn about the other side’s pressures and worries. If you follow these tips, you will be in a stronger position to walk away if you don’t get what you want. You must always keep the option of walking away open since that is a powerful signal to the other side that you mean business. After all, if you settle for something that you didn’t want, you only hurt your business.